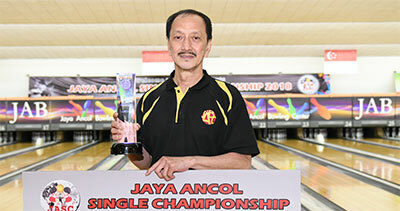 4th May, Jakarta: Indonesian veteran, Sukinto Wijaya clinched the Classified division Masters crown of the Jaya Ancol Singles Championships 2018 by a slender margin of four pins from Malaysia's Nur Nais Falilnesa and Indonesia's Prabu Putranto a further six pins. The 63-year-old got off to a great start rolling 213 plus an 18-pin handicap to lead Nur Nais by 10 pins with Putranto a close third. Putranto posted a higher 224 in his second game to take over the running after Sukinto stumbled to a 179. Putranto remained in the lead despite managing only 181 as Sukinto continued to slip away. Nur Nais added 202 to take over second spot. Another good game from the Nur Nais allowed the Malaysian lass to move into the lead, 26 pins ahead of Puranto. Nur Nais continued to lead the pack after another two games as Putranto trailed in second. Sukinto recovered to stayed in third. Nur Nais stumbled to a lowly 144 in the seventh game while Puranto shot 203 to become the pace-setter. Sukinto downed 224 to moved up to second as Nur Nais felled down to fourth behind a third Indonesian, Adhy Latif moving into third. Sukinto continued his relentless pace by adding 200 in the eighth game to regain the lead. Putranto managed only 175 to slip to second. Sukinto added 190 in the ninth game to remain in the lead while Nur Nais recovered with 234 and can only stay in third, 5 pins behind Rustam E of Indonesia and Putranto dropping to fourth. Sukinto ended with 171 to clinch the title with 2080. Nur Nais snatched second spot with 2076 and Putranto recovered to take third position with 2071, a further 5 pins away. Latif and Rustam completed the top five with 2056 and 2045 respectively. Sukinto won 50 million Indonesian rupiah (approx. US$3,500) as champion. Nur Nais picked up 25 million rupiah as first runner-up and Putranto took home 12.5 million rupiah as second runner-up. Latif and Rustam earned 10 and 8 million rupiah in fourth and fifth positions. Ryan Lalisang, Organizing Chairman was on hand to present the trophies and prizes to the top three winners. The championship will conclude with the Mixed Open Finals tomorrow commencing at 10.00am local time. 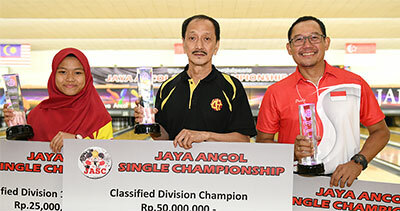 The championship is sanctioned by Asian Bowling Federation and World Bowling attracting bowlers from Australia, Brunei, China, Hong Kong, Malaysia, Philippines, Saudi Arabia, Singapore, Thailand and UAE.